What are you lusting after this month? One of my top 6 lusts for November is seeing the Christmas decorations in London. 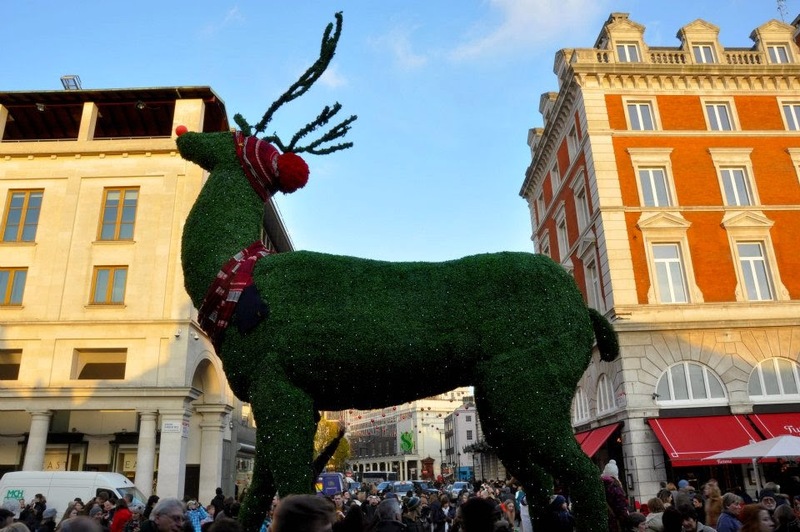 They are always spectacular just like this huge reindeer in front of Covent Garden in 2012. In no particular order, here is a short list of the things that I lust after in this glorious Italian month of November. I feel that if I experience them, my life would be so much more exciting and enriched. Some long-haul travel– yes, it’s true, apart from a couple of countries in the Middle East and a fleeting visit to Egypt, I haven’t been beyond Europe in my whole life. I am sure I am missing so much because of this. Lately the obsessive thought of going to New York keeps coming to my mind, popping there at any time and day, making me sigh: ‘Oh, wouldn’t it be good!’. Well, I need to wait and see what the New Year will bring. And, perhaps, I need to start making plans. A woman with a plan is a dream half come true, ain’t that so? A makeover – yes, it sounds like a big cliché, but after being exclusively a mummy in the past year and a half, I feel I need to do something about myself. Something nourishing for my soul and body would be great. I need someone with a lot of experience in these things to take one look at me and say: you need to cut your hair this way, wear this type of make-up and get a whole new skincare product line. Left on my own devices, I feel quite overwhelmed and not quite sure where to start. A new book to read– yes, the last new book I read was two and half months ago. It was ‘The Taking’ by Dean Koontz. The story was very dark with a very bright and sobering end. Even though I don’t read and watch horror, as it really messes up my mind, I found this book rather good and now, months later, it still has got a grip on me. I’ve been re-reading old favourites in the meantime, but I am desperately looking for a new book to delve in that is compelling, gripping and enriching. Suggestions are welcome. Thank you very much! Seeing London Christmas decorations – yes, I love this time of the year when London gets all festively dressed and super spruced. For the 12 years that I lived there, I would pick a day about two weeks before Christmas and just walk around town from dawn ’til dusk and then some more. The amazing shop window displays, the huge Christmas trees and wreaths dotted around squares and hotels and even the crowds stressed by the endless shopping for unnecessary presents kept me in a total thrall. We will be in England for the holidays and I have already warned my husband that on one of those days, we will have to get on the train to London and just deep dive in the Christmas mood. Verona – yes, I am super excited, as we are off to Verona next week-end. The reason is the Taste of Christmas event which will be held there over three days. As a new blogger, I have been issued with a press pass and I can’t wait to put it to some very good use, finding out about traditional Italian Christmas fare and sampling the most exquisite Italian food. There is even an invitation for a cooking demonstration. I am so looking forward to writing about all of this! A box of Baci chocolates – oh, yes! Need I say more?! A box of these fabulous and quintessential Italian chocolates would do me the world of good.